Hello gang, Brian with BOE Marine here. Some of you may know me from the other forums that we are active on. I look forward to assisting you with any questions that you may have. Brian, glad to have ya, welcome aboard. Welcome Brian. BOE marine supplied all the electronics for my Pacific in 2005. They were and are a great company to deal with. Brian next time you are in Gloucester hanging with those Wicked captains stop by my slip and say hello! I have a question for you. 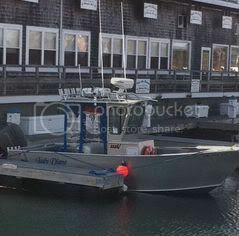 What is your recommendation for a plotter, sonar, radar and radio purchase for a 22' Pacific walk around. Looking at a complete replacement of what is there? I want the radio to interface with the plotter for DSC function and AIS. Would like to keep things as simple as possible. I have attached a picture of the installation real estate. I'm not current on marine electronics in general but would like to be more informed, and most of the Forum here would too, lots of readers that don't post but are seriously involved in metal boats. I'd like to suggest a series of articles by Boe'Mar'Br'n that give some overall market view? Say a review of the main brand's and their trends; ie. A series of trend observations would allow us to learn from your expertise in the market, and at the same time help readers to see where marine instrumentation is headed. By showing the different network choices (if they still don't have one single standard?) the Forum could begin to understand the network pro's and con's that could contribute to a more informed purchase decision in the future? By helping those who don't work in or buy new electronics regularly ( I think) you'd boost your firm's position as supplier and help the Forum to more wisely spend their marine electronics bucks; and where would they likely spend those more informed dollars? Bow Marine. If this is already done, and you're willing to link to those articles you may have already posted, I'd sure like to learn about the current market offering and its architecture. Better would be copies here at AAB.com but worst case... I'd sure take time to read the links. We often hear from new metal boaters, and go around this bush again and again, as a vendor with lots of experience what are the install basics, how should the AC and DC systems be bonded ? (or should they?) how does your firm handle wiring conventions that you install? What are the antenna issues with small metal boats? What do you do for transducers? Hull penetrations of glued to the inside of the hull plate? (I could go on but there are quite a few questions we seem to hear over and over so your contribution could be " the words from the Pro" and we could just link to the post in reference to questions in the future? Thanks for any time you can spend here sharing your knowledge.